Here’s something crazy. I had tickets for Beyonce’s Formation tour that stopped in Los Angeles a few weeks ago, and I almost didn’t go. Yes. I almost didn’t go because I didn’t want to go alone. Stupid, right? Granted, parking fees at the Rose Bowl could deter anyone, but once you’ve spent upwards of $200 on a ticket, you shouldn’t be pre-occupied with that marginal cost. I acknowledge that I didn’t have to go alone. I could’ve asked my new friends in LA if they wanted to go. I could’ve broadcast my intentions on Facebook and gathered a group to buy tickets together. I could’ve done all these things, but I just didn’t feel like they’d happen, whether due to scheduling snafus or their general disinterest. I was prepared to feel alone in LA. It’s a sprawling metropolis, and everyone’s busy with their own lives. I still haven’t made a ton of friends here, and those I can call new friends, I don’t know very well yet. I’m doing my best to change that though. Ironically, it is one of these very friends who slapped verbal sense into me and encouraged me to go to the concert. I’m very glad I did. 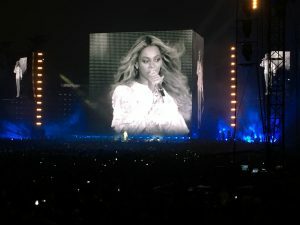 Beyonce’s set, a giant LED-covered cube that opened and closed to reveal her and her dancers, projected her magnificence so that everyone in the stadium could see. The guys behind me abandoned their chill and turned into blubbering fangirls. At first, I felt self-conscious as a solo attendee sandwiched between drunk middle-aged women gal pals and a son and his (probably confused) father. I wanted to bop along to Snoop’s surprise performance of “Drop It Like It’s Hot.” I wanted to go crazy and wave my arms and scream, “Yas, yas, YAS!” But I was alone, and I contained my crazy. I spotted another girl a few rows in front of me, who I later realized was also attending the concert alone. Carefree and decidedly not self-conscious, she jammed along to the beats. Suddenly, I felt silly. I had thought all along that I would be one of the minority coming alone, but right there was another example. 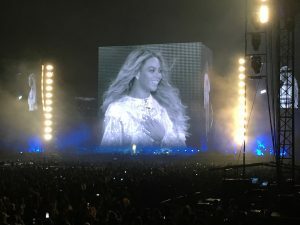 Bolstered by the Beyhive around me, I started letting loose during “Run the World (Girls).” And then Beyonce delivered just what I needed that night. 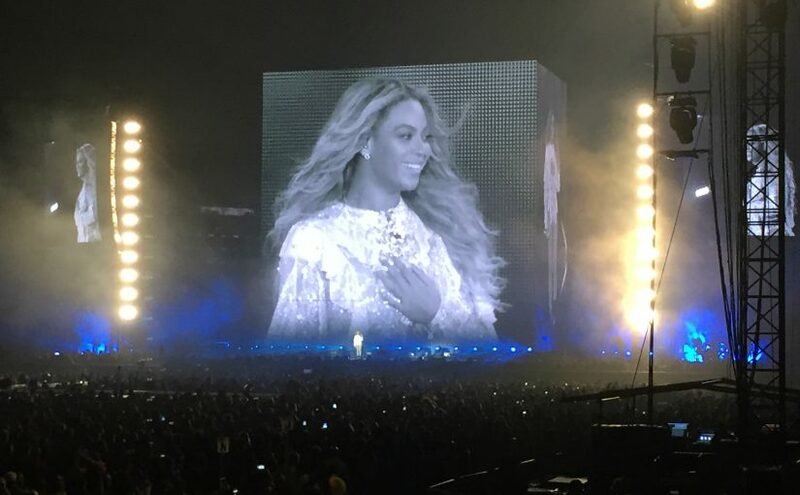 She is an omniscient queen indeed.